Welcome to the Official West Toluca Lake, California Home Page. Feel free to make yourself at home and see what our community is all about! Bounded by the bustling North Hollywood thoroughfares of Camarillo Street to the north, Riverside Drive to the west and south, and Vineland Avenue to the east, lies the vibrant little community of West Toluca Lake. Fast becoming one of the best unkept secrets in the East Valley, this charming neighborhood is comprised of an architecturally diverse collection of sturdy, demure homes set on deceptively generous lots. The dappled sidewalks of Blix Street, the great trees of Kling, the “Castle” of Hortense, and the shady seclusion of Sarah all contribute to the unique ambience of this hidden hamlet. The short north/south stretches of Elmer and Bellflower Streets tie it all together. Made up of approximately 260 homes and various well-maintained boundary apartment dwellings, West Toluca Lake sits in enviably close proximity to Hollywood, Burbank, Studio City, Toluca Lake, Universal City, the shops of Ventura Boulevard and the trendy NoHo Arts district. The tangle of nearby intersecting freeways can easily send you in any direction. The name Toluca, which means “fertile valley,” was the name of an actual Indian village located on the Los Angeles River over 4,000 years ago. The modern community of Toluca Lake takes its name from this ancient village. The village was actually a part of a larger village named Kawenga. Campo de Cahuenga, a historical site now located in Universal City, was where the treaty was signed between Mexico and California ending that war, giving America most of California. The commercial district of Toluca Lake is located approximately 2 miles due west of West Toluca Lake on Riverside Drive. Lankershim Gardens eventually blended into North Hollywood, and our neighborhood was called North Hollywood for decades. The movement to become “West Toluca Lake” was started by former resident Shone Kirkpatrick, who lived on Blix, in the mid- 1990’s. Shone (pronounced “Shawn”) felt this neighborhood needed an individual identity, and teamed with fellow neighbors to make a committee. The committee consisted of Amick Byram, Gretchen Schreck, and Karen Collier. Shone’s biggest achievement was the development of the West Toluca Lake Resident’s Association, of which he was the first President. The Association would be the driving force behind the continuing enhancements of West Toluca Lake. One of the initial goals was to select the name for our community. The three choices that made the ballot were “Toluca Corners,” “Toluca Village,” and “West Toluca Lake.” Shone was hoping for Toluca Village, and was so confident that it would be selected that all of the papers to be submitted to the State featured Toluca Village, and had to be refiled. West Toluca Lake was established in 1995. The name change became official in August, 1996, and the city of Los Angeles put up “West Toluca Lake” signs along the borders. Shone moved away in 1997, and when he left Harry Flynn became President of the Association. Harry is and has been an avid runner. Over time, he built relationships with the people as he would pass by, running up and down the block. A resident for exactly thirty years as of March, 2002, when Harry moved into his house on Hortense the street was known as “Rosary Row.” This was because of the large number of families with at least eight children per household. Most of these families sent their children to St. Charles School on Moorpark, and attended St. Charles Parish. St. Charles has been an integral part of West Toluca Lake since its early years, its influence on the community continues to this day. West Toluca Lake has many traditions. In 1982, Harry was a key player in introducing the Annual Neighborhood Block Party. 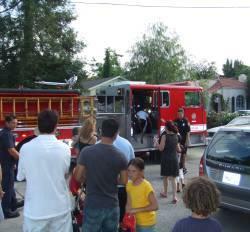 In 2002, we celebrated the 21st Annual West Toluca Lake Block Party on June 23rd, held at its usual location on Bellflower Street, between Hortense and Kling. In 1982 Harry also started the Neighborhood Watch Program, which is still alive today. These meetings are held quarterly on Monday evenings at Margaret Fusek’s stately home on Kling Street. Officer Nancy Reeves, of the North Hollywood division, has been an essential part of these programs for years, keeping the local constituency current on the latest crime statistics and goings-on. Other West Toluca Lake traditions include our annual July garage sale, the Halloween Party in October, and the Magical Christmas Caroling Truck that starts its Christmas Eve journey to Toluca Lake right here on Blix Street. Modern West Toluca Lake is a mixture of young and old, newcomers and old-timers, many of whom are second generation. Sisters live down the street from sisters, mothers around the corner from daughters, fathers a block away from sons. Many, like Bob Hardaway, have grown up here, left, and then returned to live out their golden years. There is even a flock of wild parrots that returns year after year in ever expanding numbers to its beloved roost on Blix Street. The neighborhood holds an irresistible charm that draws you in and persuades you to stay. A few celebrities, faces familiar from TV and film, live quietly and happily on these streets. Other residents work in various other behind-the-scenes facets of the film and entertainment industry. Many residents are retired. The common thread is the love and loyalty they share for this tiny community. 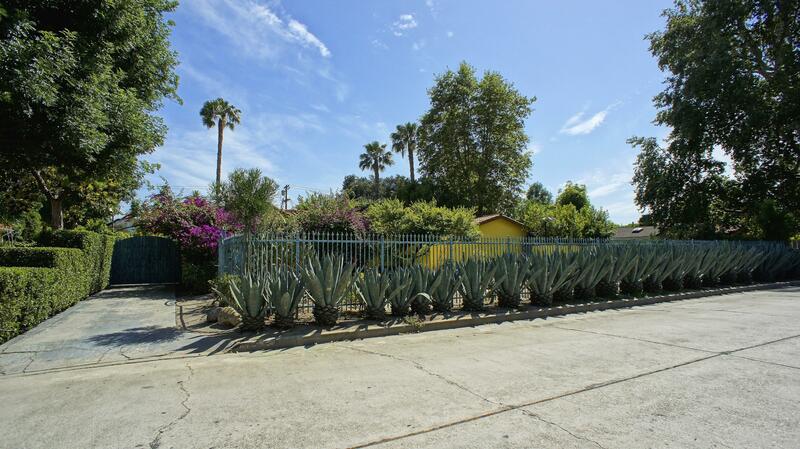 West Toluca Lake Real Estate is a hot commodity. Many of its current residents are people that just happened upon the little enclave accidentally and had to stay. Just wander the six streets that make up the little enclave and you will see why. From the wonderfully untouched 1920’s Spanish Homes to the wonderful Craftsman style with their, come sit down awhile, porches. What you won’t see are street after street of McMansions. Somehow West Toluca Lake has been spared that blight. This is a place that screams of a simpler time days. A place where everyone knows everyone, where kids still play ball on the street, and couples and families stroll lazily on a summer’s evening. Check it out yourself. 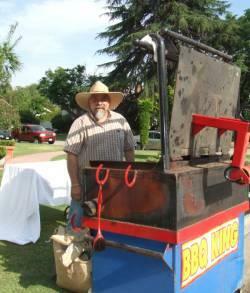 Perhaps the day you visit the residents will be having their annual Block Party, complete with the huge BBQ. Or maybe you'll stumble upon the annual garage sale or Halloween party. This history of West Toluca Lake was compiled from various sources, including residents Steven Schreck, Harry Flynn, Laura Charelian, Dorothy Hines and Toluca Lake Real Estate Specialist Heather Farquhar. 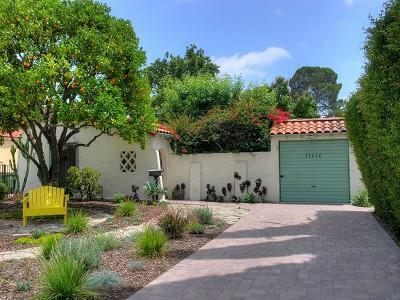 Want To Know The Value Of Your West Toluca Lake Home? Sited on a huge lot (over 16,000 square feet) and hidden behind steel gates, impressive drought resistant garden and high, solid walls this breath-taking property offers the resort-like living and ultimate privacy you have been looking for. Located in West Toluca Lake this 1920's Spanish features hardwood floors, a fireplace in the living room and the master bedroom, large formal dining room and the lines and arches of a bygone era. Each room opens to the lush backyard gardens and peaceful courtyard complete with elegant fountain. Entertain guests by the gorgeous pebble bottom pool but beware once they see the beauty of your private oasis they may not want to leave. State of the art security system.